Get started with the Thrive guidebook! What are your organization’s goals? Do you need to increase donations? Get more people to take advocacy actions? Retain or increase membership? Thrive is built to help you achieve those goals by turning fans and followers into passionate supporters of your organization. Thrive is web-based software (a social CRM) that helps you find and nurture key relationships online while offering a streamlined, uncluttered interface from which to manage Twitter and Facebook. Thrive even offers robust reporting and analytics tools so you can learn from and replicate your successes. Reach new supporters through keyword searches. Organize your contacts with tags so you can target your donors, prospects, volunteers, media contacts, VIPs, etc. Find your influencers - see who’s retweeted you the most, mentioned you the most, and who you’ve contacted most recently. See biographical information to contextualize the conversation. DM or @ reply to multiple people on Twitter simultaneously. Manage Twitter, Facebook and bit.ly. Schedule messages with the calendar view. Receive and respond to all inbound messages in one place. Tag messages as “positive,” “negative,” “important,” and/or "follow-up." 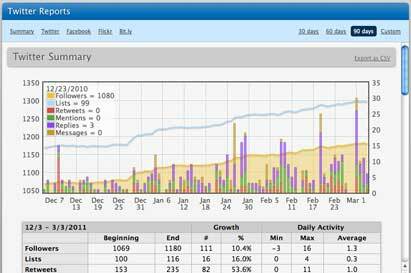 Detailed summary reports (overview and individual reports for Facebook, Twitter, Bit.ly). Retweets & Reach and Mentions & Reach Reports. Drill down in each report to see which specific messages drove the most engagement. Toggle 30-, 60-, 90-day views and custom date ranges. Download individual reports as .csv files so you can compare them with other data sources and generate custom reports based on your organization’s needs. Personalized, one-on-one onboarding to the software. 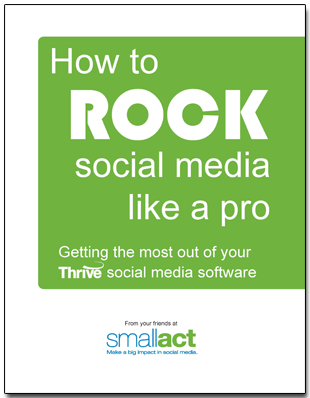 Monthly webinars from experts in social media and Small Act staff. Are you drooling yet? Why not schedule a free demo? *Email list conversion is only available in our Enterprise packages. Call or email us for more details.